Take a pinch of tobacco rolled into a small ball about the size of the "hizara" (the bowl of a kiseru). Traditionally, it is lighted on with embers in the "hi-ire",the fireplace of a tabako-bon. Of course, it's possible to simply use matches or even a lighter. 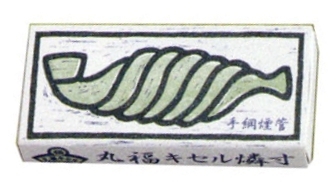 There is also a Japanese brand of matches specifically for kiseru. Those are quite long matches which is convenient for kiseru use : the rest of the match uncalcined being used for scraping the bowl after smoking. After lighting the kiseru, take a few puffs, and then, to get rid of the ashes stucked into the bowl, tap the "gankubi" on the edge of the ashtray "hai-otoshi" of the tabako-bon. If you use an ordinary ashtray take care not to damage the gankubi. In Japan, "hai-otoshi" are usually made of wood which is softer than a metal or glass ashtray. Some also tap directly gankubi against the palm of their hand. There are naturally no rules on how one should hold a kiseru... Yet, the above image shows four traditional ways to hold a kiseru allocated to different categories of individuals : (1) 町人 chonin "townspeople", (2) 博徒 bakuto "tenants of dens", (3) 武士 bushi "samurai", (4) 農民 Nomin "peasants". - Cutting a cigarette (approx. 2 cm) and pushing it directly in the bowl "hi-zara". - Using only the beak of the kiseru "suikuchi" as a cigarette-holder. Naturally, it is more pleasant to smoke with a clean kiseru. As for any other pipes, it is recommended to clean the kiseru after each use. Usually, the bamboo pipe "Rau-kiseru" can be replaced if necessary: metal tips are simply nested (without glue or other) which allows to 'dismantle' the kiseru and change the bamboo if damaged. Tips are thus not permanently attached to the pipe, except for "all metal" kiseru, which parts are welded together. 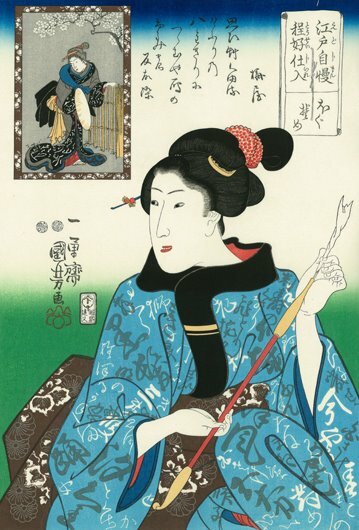 In the past, as shown on the woodblock-print below, people used washi (traditional Japanese paper) to clean the kiseru. Washi that was produced at that time was very strong but now it is the quality is not so good and the frays in the kiseru, leaving small pieces of paper that eventually clog the kiseru. Now, it is recommended run a pipe cleaner back and forth through the stem to clean it. Pipe cleaners do not fray and can absorb moisture and remove dirt and tar. See kiseru-cleaners.